The National Accountability Bureau (NAB) moved to take Nawaz Sharif’s son-in-law Capt (retd) Safdar, convicted in the Avenfield properties case, into custody and announced initiating legal proceedings against all individuals who sheltered and helped him evade his arrest. Capt (retd) Safdar was sentenced to a one-year jail term on July 6 by an accountability court. Before his arrest, Safdar staged a rally in Rawalpindi and lashed out at the state institutions and asked supporters to stand up against “injustice”. The rally was attended by hundreds of local PML-N supporters and workers and leaders. His arrest warrants were issued by the accountability court on the same day it pronounced the judgment. On July 7, three NAB teams raided various addresses in Mansehra, Safdar’s hometown, for arresting him but he managed to evade arrest. NAB teams also raided his houses in Haripur, Abbotabad and Mansehra but remained unsuccessful in making the arrest. On Sunday afternoon Capt Safdar appeared at the main election office of PML-N leader Hanif Abbasi on the Sixth Road in Rawalpindi and announced to surrender before the authorities concerned. Sources said Safdar had spent Saturday night at the house of a local PML-N leader in Rawalpindi who is contesting for a provincial assembly seat in the garrison city on a PML-N ticket. 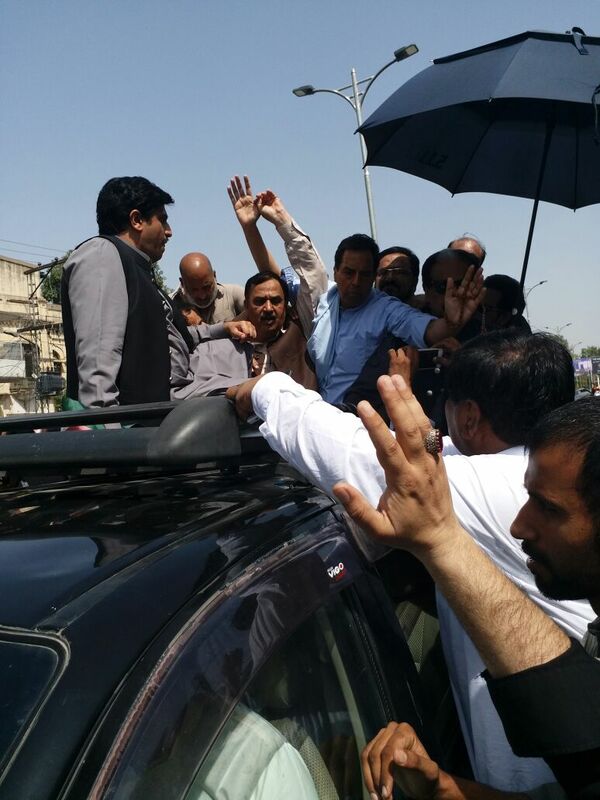 Accompanied by local PML-N leaders, including Chaudhry Tanveer and Shakil Awan, Safdar started the rally from the congested Raja Bazar area. As the rally passed through Murree Road, hundreds of PML-N workers surrounded his vehicle, thwarting NAB and police’s attempt to arrest him. It is learnt that local PML-N leaders and NAB officials had made a verbal deal that Safdar would not be arrested until the rally reached the Sixth Road. The rally arrived at a pre-fixed spot after six hours where he surrendered to NAB officials. Speaking at the rally, Safdar criticised the superior judiciary and the army. According to him, this entire affair was a ploy used by the establishment and courts and NAB was being used in this conspiracy. Praising Mumtaz Qadri, who murdered former governor Punjab Salmaan Taseer, Safdar shouted slogans in his (Qadri’s) favour. He insisted that he was being victimised for openly supporting the cause of Khatm-e-Nabuwat. When the rally arrived at the Sixth Road, the number of his party supporters had dwindled down to just 300. After his arrest, NAB issued a statement expressing displeasure over Sunday’s turn of events. “If he (Safdar) was a law abiding citizen, he should have surrendered himself before NAB soon after the judgment was announcement against him. He is a convicted and corrupt person who is posing himself as a pious individual,” NAB’s statement read. “NAB will start legal proceedings against all those who provided illegal shelter to a convicted person and (helped him evade his) arrest,” the bureau stated. It requested PEMRA to provide footage of all TV channels to help the bureau identify all the culprits. NAB, it stated, knew where he was in Rawalpindi and when its officials arrived there some of his party leaders and activists had created a law and order situation. The bureau accused Safdar of indulging in hate speech. “The chairman NAB has taken serious notice of sheltering an accused person and ordered the DG NAB, Rawalpindi to (launch a) probe (in this) matter,” NAB stated. According to the NAB announcement, the bureau’s chairman had also asked the DG NAB, Rawalpindi, to determine why did the Rawalpindi Police not stop the people from joining in the rally staged by a convicted person in contravention of Section 144 imposed in the city. Capt Safdar was later shifted to the office of NAB Rawalpindi. “A team of doctors … examined him and declared him (to be) physically fit. He will be produced before the accountability court on Monday (today),” statement read. Meanwhile, NAB in a statement said that it has identified those PML-N leaders who provided shelter to Safdar and created hindrance in arresting him.